A self-styled Sherlock Holmes leads an unlikely team of irregulars in this charming comic mystery from indie auteur Aaron Katz. After abandoning a promising academic career in forensic science, aimless Doug (Cris Lankenau) returns to Portland to live with his more responsible big sister Gail (Trieste Kelly). He easily lands a dead-end job working in an ice factory, but his latent passion for detective work is stoked when his ex-girlfriend, Rachel (Robyn Rikoon) goes missing. Armed with a handful of arcane clues and a vast knowledge of the world of Sherlock Holmes, Doug enlists Gail and co-worker Carlos (Raúl Castillo) in a ramshackle investigation that draws the slacker sleuths into Portland's underground. What they discover is a complex trail of clues, leading them increasingly close to the discovering the mysterious truth about Rachel. Building on the lyrical style and naturalistic performances of his two previous features, DANCE PARTY USA and QUIET CITY, Katz offers a refreshingly idiosyncratic spin on genre conventions. 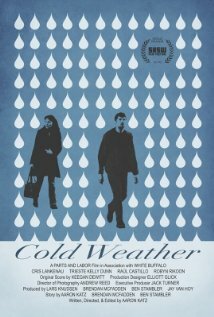 COLD WEATHER is simultaneously the story of a brother and sister getting to know each other after years apart and a mystery in the great tradition of crime and detective fiction.